Want more information on the Roger Revelle? Click here. 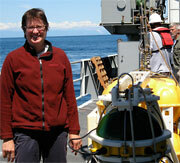 Anne Sheehan reports from offshore New Zealand, where she travels to recover ocean bottom seismometers and seafloor pressure recorders deployed last year. The data will be used to study earthquake processes and deep structure below the Hikurangi Margin of New Zealand. We thank the National Science Foundation for support.